All pics can be clicked on for larger versions..
Feel free to SIGN IN, post links, Blog ideas, input, comments about the BLOG, pretty much anything you want here as long as it’s not rude. I always enjoy reading comments from everyone around the world! I am open to new ideas, how to make this a better place for all readers, so go for it. Let me know what you want to see and we will see about posting it. It’s because of you guys this blog is read which makes it such a great thing to do in my spare time. Look forward to getting outside input. she is not allowed to comment on her equipment. 😉 Thanks for sharing the video though. I was on a picture viewing page, and it began to snow on just that page, and it lasted about a minute. It was 1:20 am EST, I was wondering, was it set up to snow for just a minute for a reason? If you stay long enough on a page the snow flakes should last the entire time…my holiday touch for the BLOG! First of all, You have a great blog and I enjoy reading it everyday! I’m only following this blog since 2weeks though. I like all your adventure storys, keep up the good work! I live in Belgium, and planning to buy an adventure bike. Usage: 20% offroad 80% road. I’m quite stuck when it comes to make a choice between the two bikes. I know that both bikes a great, but have a slight preference for the bmw. Only issue could be the height of the bmw. Do you know if a lowering kit (springs ext…) of touratech can be combined with ESA? Would you lower you bike? I know there are lower seats, but are they as comfortable as a comfort seat? Can a f800gs be as good as the tiger800 on the road? As for the tiger 800xc. I wrote a lot of issues about stalling. What do you think about the tiger? Thank you in advance for your opninion. P.s: dutch is my primary language, excuse me for the writing errors. Hi Michael thanks for checking out our blog. We never owned the Triumph Tiger 800XC bikes. They were loaned to us. It is a great bike with a few missing conveniences. Tigers do not have handlebar controls. No easy on/off ABS button was my big issue. We could have bought the Tigers but went with the BMW F8 because we felt we got more for our $$ and I have a custom seat with gel pad which makes my Beemer VERY comfortable with the ESA. You can order a factory lowered F8 and that would be my suggestion if you go the BMW route. You say 20% off road? Don’t under estimate yourself. If you have never owned a bike like this before you will find yourself craving for dirt. The Tiger is a great on road bike and more than capable off road too. it has an adjustable seat that BMW should have integrated in their 2013 model but they did not. Both bikes with the 21inch front wheel feel like they want to stay upright in a curve but once you get used to the 21inch front you will lean your bike more and trust it. Just like Michael above, I’m torn about which bike to get: the 2013 BMW F800GS or the Tiger Triumph 800 XC. I’ve read that the older F800’s felt “buzzy” at highway speeds. Do you find it’s the same thing for the 2013 model? Great website – I’ve spent a lot of time reading your adventures and reviews…keep it up! Did you get the chance to read my reply above your comment? The BMW Twin engine does run a bit rougher than the Triumph’s Triple. Like anything else you get used to it just like we did on the T800…that smooth Triple is nice. The new 800’s still have a buzzy engine but this bikes goes like a bat out of hell. 😉 Both are great bikes depends on your own taste. Looks plays a role for us and the new F800 to us looks leaner and having the tank below the seat really makes this bike a bit more nimble and less top heavy. The Tiger gets worse gas mileage but in the bigger picture I guess that really is not a deal breaker. For me personally I never liked the lack of handle bar controls on the Tigers. Triumph will I am certain introduce this on the 800’s in the near future. They have to…makes sense and for the money you spend on the Tiger they will have to bring more conveniences for the rider. For 2013 there was no change or mention of this convenience and for me I want easy on/off abs control, ambient temp, more OEM heated grip look….the Tiger has these very large buttons, almost an animated after market look to them as well as their AUX light switch. Nothing to do with the engine though, all cosmetics. If you buy a bike let us know what you choose and thanks for stopping by…good luck and Happy Holidays! I did read your response to Michael’s post about the Triumph being smoother, but nothing about the buzzing that the 08-12 F800GS’s where known for. I would have thought that with everyone reporting engine buzzing at highway speeds, BMW would have tried to fix the problem for the 2013 model? I guess to get a bike that is good off road, you have to sacrife some of it’s on-road capabilities. Oh well, doesn’t sound like a deal breaker. Thanks again for the quick and informative response. It’s always good to get information from someone who actually owns the bike instead of someone testing it out for a day. Enjoy the holidays! great blog, i am learning a lot. i am a cruise bike rider who is feeling adventurous and wanna shift to dual sport. Welcome revolutionary Egypt! DS bikes are a great way to travel down your way. Thanks for stopping by! Happy Holidays ladies! Because you inspired me with your adventure ride, I am finally getting that Tiger XC that I ordered last July. I’m sure it’s worth the wait. Let us know when you take your first ride. CONGRATS! Hey TomCIII, any word on that Tiger of yours? First impressions? Hi guys! Well I’ve put in roughly 800kms on the bike and here are my thoughts on the bike. First off, that matte khaki green color is getting a lot of attention. I am the first in the Philippines to own one. I’m being extra careful with scratches and other stains on the finish. Having owned a BMW R1200GS for 5 years, I’m quite impressed with the handling, the torque and the comfort of the XC. I’m almost tempted to say that it’s a lot better that my GS but then that’ll be like comparing apples with oranges. Besides, my GS was kind to me till that fateful day in May 2012. Haven’t really gone on a long ride in the countryside (which will happen in the next couple of weeks) I already know that I’ll be having a blast. My only complaint would be the heat on my right leg in stop and go traffic and the bike not having tubeless tires. My worst nightmare in a ride is having a flat tire. Would I recommend this bike ? Most definitely! Just out of curiosity, would you guys use/recommend/try using scottoiler? (http://www.scottoiler.com/us/bmw) I’m interested in getting one but still I’m not sure nor I know anyone from the area I live that uses it so I would like to know what you guys think about it. We thought about installing Scottoilers on our bikes numerous times…but two things comes to mind…when you are riding off road in really dusty conditions….nothing would work to keep your chain lubed. Two…not sure we would want to spend the money on this if we know we can do our own chain maintenance…I mean you still have to clean your chain every once in a while…when we ride on the road/pavement spraying the chain every 500KM’s or a little more is no problem. I thought you two might enjoy reading about one of the heros of the RCMP. I was fortunate enough to receive some great training from this man several years ago. I was assigned as a rescue diver and was sent to several schools where he taught. He was a big player in the world of dive rescue. Tom the heat is more prominent on the Tigers but we always wear riding pants could not feel like others. You live in a very humid climate will be interested in how that heat progresses in the summer. You’ll have a great time on the bike and down the line we are actually thinking of getting some custom rims that are tubeless. About $2000 for front and rear for each bike so we will have to wait a bit but they will have spokes. Congrats and enjoy! Heck! I’ll just attend your wedding and enjoy some good ol’ Canadian hospitality. What you say? Sure join the party. 60 are! Hi, Just found your site through google+. Great resource and source of awesome trips. Also double plus awesome is that you are in Canada. Millions of US sites with wonderful thoughts and ideas on where to buy gear, etc in the US but as you know its a different story North of the border. Welcome Paul..hope to see and hear from you more often now that you found us…thanks for stopping by and for your kind words. Hi gals I want to thank you also, you have answered so many of my questions. I am selling my bmw k1200rs and about to bring home a kitty.I have been riding dirt for years and now want the freedom to have both dirt and long hall st. options. I live in San Franscico bay area. If you ever need a garage and a place to crash you are always welcome. What are you getting? The Tiger? XC? Thanks for your nice comment and for taking the time to stop by our BLOG. Hope to hear more from you! Congrats on your new bike! Love your blog. I ride a cruiser and have never ridden off road, but I think it is something I would really enjoy. I am considering buying a BMW 700GS with the lower suspension but it doesn’t come with the ESA. Does ESA really make that much difference to your riding experience? Tracey how tall are you or rather what is your inseam? I am 5’1, and my inseam is 29. We really like the ESA especially the sport off road and the comfy setting on the pavement. If you could try to the low seat with regular stock height and then after you buy the bike get your low seat trimmed on the sides to make your legs tighter fitting to the bike you might be able to feel confident on the 700. I ride the 800GS with low seat, stock height and although I am not anywhere close to flat footed I have learned to ride this way and not nervous anymore. it can be done it is all about your own level of riding skills and if you think you can handle the bike. You guys rule ! Awesome page…just got started with my new F700GS and reading and seeing stuff like the one you posted makes me wanna grab my bike and ride away ! Congratulations from San Antonio, TX ! Thank you for all the valuable information and expertise shared…a true goldmine for new comers like myself ! god bless ‘ya ! Love the site, and the frank comments and criticisms (good and bad) about everything. Thank you for that. 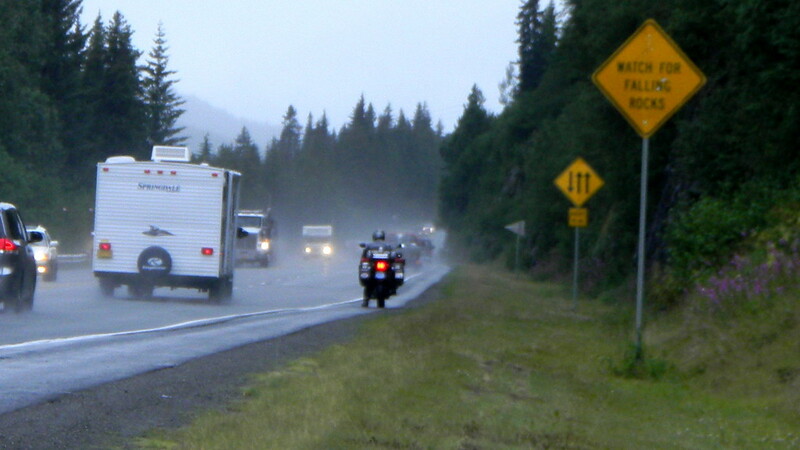 I have a 2009 F650GS, and am thinking about riding to Alaska…with a passenger on the back – my wife, who is much physically smaller than I. Do you have any thoughts or heard any stories about that? I have not seen or read much about it on the internet. Thanks again! Make sure you have a sheep skin or air hawk pad for the both of you or maybe you all ready have a better seat? It will be a snug fit on your bike but doable if you travel well😉 together. You might feel the need for more power depending on where you go up there. Pack light, again depending on where you go bring extra gas especially since you are two up. Don’t over plan, have good gear that is waterproof, bring bug spray and have fun! BTW..thanks for stopping by and posting your comment! Welcome Jim and maybe you might need to get you and your bike over here and ride the 1000’s of KM’s we have off road…;-) Congrats on your bike and thanks for signing in! Hope to hear from you some more as you break in your great looking bike! I was checking out some blogs about travelling using a motorcycle and seen this site, great site I am enjoying reading your blogs 🙂 By the way, I have seen one story as well that anyone will be interested. It is about the GUINNESS WORLD RECORD: MIDDLE KINGDOM RIDE if you want to check out some of their videos you can check it here: http://www.youtube.com/user/ProductionsG21. I also purchased one of their books, it is worth reading http://www.amazon.com/Ryan-Pyle/e/B00AVFUMZM. Hello Cheryl & Leslie…wishing you both all the best in the next years to come! From sunny San Fransisco, Jeff Jackson & family! Do we know you? Jeff as in Jeff? Please tell me your thoughts about the Britannia Composites Mirage 2 screens. Does the dash impair your forward view enough to effect your riding? Or is it something you adjust to? I’m 5’8″, so I’m a little worried. Great blog, by the way. No impairment at all. Don’t be worried and it’s a decent shield. Does let wind get around the fairing but I like it. The shield scratches easily but can be replaced for a few bucks. Great location for the GPS. I just bought and installed the Mirage 2 and am absolutely in love with it! As with every love, however, there are some minor perks 😉 my headlight protector does not fit. I noticed Leslie uses a headlight protector with her Mirage. Would you be so kind and tell me what brand it is and if it required any adjustments to it before fitting with the Mirage? Also my handguards (BMW OEM) touch the fairing when in full lock like moving the bike in the garage. I’m worried about the handguards braking the fairing if I drop the bike. Do you have any issues with that? Hi and thanks for you great Blog about Alaska trip on the Triumph. I am going to take that trip May 30 2014 for about 7 weeks or so I have a ? Checked my Scouts and they are the same we had on the Tigers and 650’s. So, tubes in tubeless yes. It’s the rim that counts. Hi Ladies. I really appreciate you sharing all your experiences and knowledge with us. There doesn’t seem to be any other websites for girls on BMW’s specifically. Booo. I’m looking for some advice. I’m in my 20s, 125 lbs, 5’8″ with a 31″ inseam and I’m ready to buy my first bike (newbie). My boyfriend has just upgraded to the new 2014 1200 GSA. I want to tour cross-country as well as go off-road. I’m looking at the 800 GS Adventure. Sitting on the 800 Adventure’s standard seat I was on the balls of my feet (not toes). In contrast, I was flat footed over the standard 800 GS with the lowered seat (33.5″ or 32.5?). Note: the Adventure’s seat is wider compared to the standard seat so the reach to the floor isn’t the same when comparing same seat height. I have not yet tried the lowered seat option on the Adventure. This is next. My question is, do you think I’m being naive in believing I can handle the height of the Adventure considering my inseam? Do you know any women on a 800 GSA? If so how tall are they? I’ve been told to go flat footed as a newbie so that I feel more secure but I really don’t feel insecure not being flat footed, on the showroom floor that is. Please please please advice. Don’t know anyone women who own the GSA but you are certainly on the right track. I know the stock seat on the GSA looks the part but I too felt it was too wide. At 31 inch inseam you can handle either 800. Perhaps do try the low seat on the GSA and see how it feels. Or get the stock seat and get it modified for you. Trim the sides so your legs/thighs are closer to the bike. Hello Leslie – I am a 47 yr old newbie living in France and I just got my first bike, a great 2014 F800GS Adventure. I must say your site is absolutely fantastic and I am so pleased to have found it. Looking forward to catching up on all your advice and experience as well as following the new posts. There seem to be a lot more gear available in Canada and US for touring than here. But then again I am only new to this. Yes I have noticed that Klim Altitude and it is screaming “buy me” !! I have an old pair of BMW pants – unisex I believe – and surprisingly well adapted to the girl body shape. I also like the look of the Furygan Shield top and pants – Pity I can try things on as it’s all mail order or nothing around here. Also looking at airbag jacket vs airbag waistcoat. After reading your review about the Tigers I was more than bummed that you then bought BMWs. You know EVERYBODY rides the BMW GSs, so it looks cool to me seeing you on the Tigers. So are you alluding my review is not for real? Just clarifying because it is and why we bought the Beemers when we did was all about my pet peeves stated in the review. Plus we transferred our Jesse luggage which saved us thousands. You should love the Tiger but to be honest not sure how it is selling where I live. Hardly ever see one on the road. Thanks for writing up your adventures and experiences with the gear and bikes. I am a “returned rider” and have an older 2000 BMW F650 GS which I just love. I try to get out and ride as often as I can and last year went to the Flinders Ranges with my partner. This year is the big trip to visit my girlfriend from Uni days who has lived in Alaska for over 20 years. I am hiring a G650GS to ride to her place and meet and have some fun. Love getting a woman’s perspective on gear, bikes, all things riding ….. I too love KLIM gear but our stuff is all for the hot hot weather we get over here so buying new stuff when we get to AK. Not much need for it here in South Australia. I was in Australia back in 1991 but back packing. Road a Honda 250 in NZ though. Love your country..so HUGE and vast. Have a great trip to AK and enjoy the vastness in a different way. Thanks for commenting and hope to see you around the blog some more. I have been following your travels and posting, I think I meet you in Grand Lake Col you were on a white F800GS and Cheryl was on a smaller bike ? We talk a little I was fly fishing, I was very impressed with your knowledge on bike repairs and extra stuff. I am so sorry to hear about your separation and solo trip and then the pasting of you dog, my heart goes out for you. I glad you made it home safe. My you find love and happiness in your future travels. God bless you. You two are such an inspiration!… and a wealth of info. I ride a ’13 800GS (like yours, Leslie. I love it!) My girlfriend rides a ’14 700GS and she loves it! Thanks for all the posts. Wow, what a site. You have an amazing talent for multimedia and motorcycles. Sorry to see you had a ‘flat tire’ on the long and winding road of life – but you’ll fix it and move on. The worlds full of awesome people. Not sure how many km away that person might be but at least you’re moving along the road – yes! I hope you are getting along as well as can be. I wish you well, I admire your spirit. Please keep writing. I always enjoy your blog / posts. Thanks James…I am doing my best…thanks for your kind comment. Great Blog, keep it up and carry on. Love the new Fenix lights do you have a spot and flood or both the same? what would you recommend? What type of switch always on? High beam or combo? Thanks, Bill. You had an 18” Cee Baileys screen at one point, did it perform well? Im 5’8″ bike is lowered would you suggest same size screen? What one did you preferr? I really value your opinion! Just found your blog! Newish to the ADV world with a Tiger Xrx. Thanks for your posts – I’m the only girl I know that rides, let alone off-road.